Carryology.com on 12 February 2018. 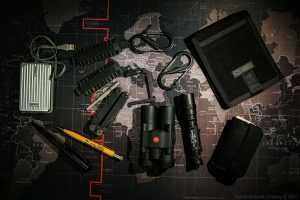 Travelling with photo gear, whether with one camera and a few lenses or, as I usually do, with two cameras and a few lenses (since I use only prime lenses), can prove challenging when it comes to choosing the ideal bag. Because there is no ideal or perfect photographic equipment, there is also no such thing as an ideal bag. There are only bags best suited for different gear, occasions, and purposes. This is why I rely on three different bags (after having tried and dismissed various Kata and F-stop backpacks) that I choose depending on where I travel to, on how I travel, and on what I need in terms of photographic equipment. I am a professional geographer and an amateur but dedicated photographer and I never travel, whether for scientific fieldwork or for leisure, without adequate photographic equipment and, as a consequence, adequate bags. I basically use two different setups. A full photographic setup that prevents me, due to size and weight, to travel with only a carry-on (at least when travelling by plane), and a light photographic setup that has to fit, along with a small and light camera shoulder bag, in one single carry-on bag in which (when travelling by plane, or even by train or car for overnight or week-long urban trips for example). 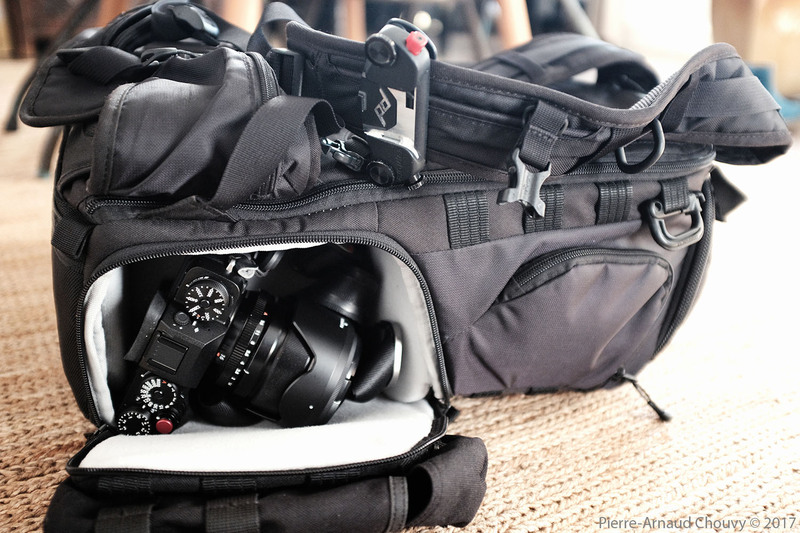 Carrying a full photography setup in a carry-on doesn’t leave space for much else and definitely not for the clothes, toiletry, emergency pack, cables, etc., needed while on the go. The type of photographic equipment matters a lot, obviously. Needless to say, hauling two professional full-frame cameras with up to 4 or 5 lenses, along with a tripod, is a very different endeavor, in terms of weight and volume, than carrying a similar setup made up of mirrorless equipment. Burma, 2010, with a 1Ds Mk3, a Canon EF 24-105 mm f/4 L IS, and a Kata R-103 backpack. 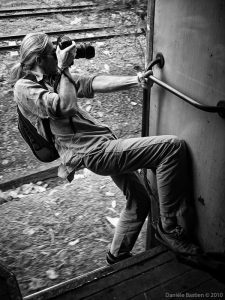 I used to travel to remote parts of the world with two Canon 1Ds Mk3 and three prime Canon L lenses that altogether weighed 4.330 kg. If I were to include my tripod, a Gitzo Traveler GT1555T (with a RRS BH-25 Pro ball head), I would then add 1.175 kg and end up with 5.505 kg of strictly photographic equipment, bag not included (yes, I did weigh every single piece of gear that I present here). Comes mirrorless equipment. Tired of hauling such a heavy equipment that was getting old and needed to be replaced, I chose, as many other photographers did before me, to switch from the DSLR world to the mirrorless world. Aiming for the lightest and smallest setup possible, I logically ended up opting for Fujifilm, giving up full-frame cameras and, sadly, the very shallow depths of field only them made possible. Still, obtaining shallow depths of field and excellent bokeh with a Fuji camera setup is very easy, thanks to the many fast prime Fujinon lenses (Fujinon is the brand name for the lens that Fujifilm designs, develops, and produces). While Fuji offers a large choice of very fast prime lenses (up to f/1.2), the smaller sensors (roughly 16 x 24 mm, compared to 24 x 36 mm for a full-frame camera) of their mirrorless cameras affect the depth of field (x 1.5) that is usually determined by the maximum aperture of a lens: a 56 mm f/1.2 on a Fuji camera is the full-frame equivalent of a 84mm that would still let the amount of light of a f/1.2 in but have the depth of field of an f/1.8 (1.2 x 1.5). This can prove a disadvantage to some but an advantage to others as increasing the depth-of-field-to-shutter-speed ratio can prove very useful in certain situations (landscape and macro photography for example). As always, choosing a photographic equipment, including which lenses to include in a bag, is about making compromises: regarding performances, weight, size, and price of course. Since I wanted to cut on my bag’s weight and volume, I felt I had no choice but to give up on the advantages of a full-frame camera (shallow depth of field, better image quality at high ISO, higher dynamic range) that basically explained its weight and size (bigger sensor, thicker body to fit full-frame lenses). Fujifilm offered what I thought was the lightest and smallest setup possible while still delivering high quality images that would still fit my photographic needs and expectations. There are many very detailed reviews of the fast growing Fujifilm equipment and I won’t add my two cents’ worth here. Again, no choice is perfect and the best compromise is never anything else than a compromise. So Fuji it is for me. 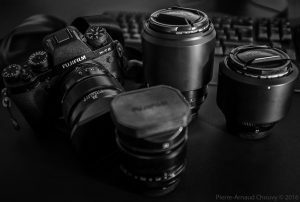 Fuji gear: one X-T2 and four prime lenses: Fujinon 23mm f/1.4, Fujinon 35mm f/1.4, Fujinon 56mm f/1.2, Fujinon 90mm f/2.0. I sold one Canon 1Ds Mk3 (1210 g with battery), one Canon 1D Mk3 (1210 g with battery), one Canon 35mm f/1.4 L (580 g), one Canon 50mm f/1.2 L (580 g), and one Canon 135mm f/2.0 L (750 g). And I replaced my Canon gear with two Fujinon X-T2 (2x 507 g) and five Fujifilm lenses: one Fujinon 16mm f/1.4 (375 g), one Fujinon 23mm f/1.4 (300 g), one Fujinon 35mm f/1.4 (187 g), one Fujinon 56mm f/1.2 (405 g), one Fujinon 90mm f/2.0 (540 g). Total weight: 2.821 kg. That is, 1.5 kg less than my Canon setup but with 2 extra lenses. I won’t address the price issue in details here but let’s say that I was pretty much able to entirely finance my Fuji equipment by selling my Canon equipment. If I compare the same setups, that is, two bodies and three lenses with similar focal lengths and apertures, the Fuji setup weighs 47% (2.041 kg) of the Canon setup (4.330 kg) and takes smuch less space: basically about half the Canon’s weight if we add a few (three, to be exact) Fujifilm batteries (47 g each) because, to be honest, while the Canon battery could last up to two weeks, the Fujifilm battery will hardly last a full day (obviously a very important difference for anyone without access to electricity for days or weeks). Such a weight difference matters a lot when travelling by foot, bus, train, boat, or plane. And even more so with young children (that you often end up carrying too). Camera weight ends up mattering even more since camera bags aren’t exactly light either. The most practical bag, as far as I’m concerned, had to be accepted as a carry-on on planes, had to allow easy and quick access to two bodies, possibly without opening a back or front panel, and had to offer a decent level of customization and modularity. This what made possible by the LowePro Tactic 450 AW, a 2.7 kg backpack (with laptop compartment) with two side openings and multiple MOLLE / PALS attachments that allow for ample customization and expansion, such as follows. LowePro Pro Tactic 450 AW with two Fuji X-T2 and a Peak Design Capture Pro. A LowePro Pro Tactic 450 AW, then, complemented by two 5.11 H2O water carriers (2 x 110 g) attached to side PALS webbing (each fits one Nalgene 1 liter bottle), two One Tigris D-ring 025 (2 x 10 g) for easy use of carabineers, two OneTigris Tactical Web Dominator Clips (2 x 4 g) to secure long straps, one 5.11 pen holder (50 g) velcroed inside the main compartment, and last but not least, one Peak Design Capture Pro V2 (110 g) to hold a mounted camera when hiking, running, or even climbing. Total weight of geared-up bag: 2.700 kg. The bag’s volume can be further augmented by adding a few external MOLLE / PALS pouches (5.11 6×10 vertical pouch : 201 g, and 5.11 10×6 horizontal pouch : 243 g), which can prove very convenient when in need of more storage place, for food and clothes when hiking for example. The total weight of the empty bag can then gain between 200 and 450 g. The external MOLLE / PALS webbing also makes carrying a tripod very easy and convenient (with simple – and light – velcro straps). 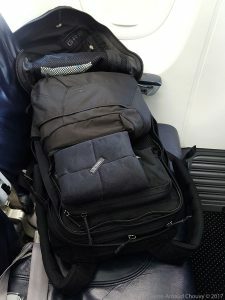 In the end, the initial size of the LowePro Pro Tactic 450 AW and its generous amount of MOLLE / PALS webbing allows it to be used as carry-on on all airlines and to be considerably expanded through the addition of external pouches (up to double the initial volume) once on the ground. While the minimum weight (that is, without camera straps, tripod plates, etc.) of my geared-up LowePro Pro Tactic 450 AW was 7.030 kg with my Canon equipment (two bodies and three lenses), it is now (with the same amount of bodies and lenses) 4.741 kg, that is, 33 % lighter (67% of the Canon weight) (the bag actually brings the weight difference down). 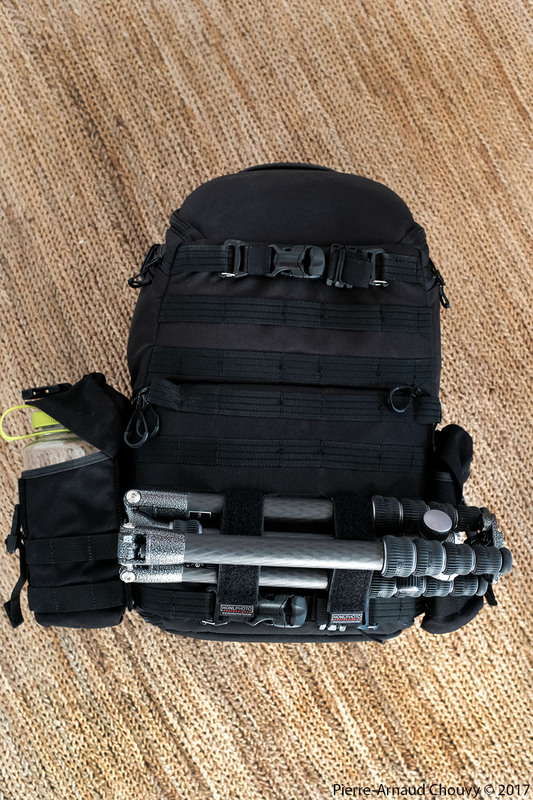 LowePro Pro Tactic 450 AW with one Fuji X-T2, a Peak Design Capture Pro on the left shoulder strap, adn a One Tigris D-ring 025 attached to side MOLLE webbing. But weight is not all and the new setup also proves much more convenient in terms of volume since the Canon equipment used to take all of the bag’s internal space while the Fuji equipment fits neatly in the lower half of the bag. What’s more, each mounted camera is now easily accessible through each side opening, with two extra lenses snugged up between the two cameras (extra lenses only accessible through the back panel). 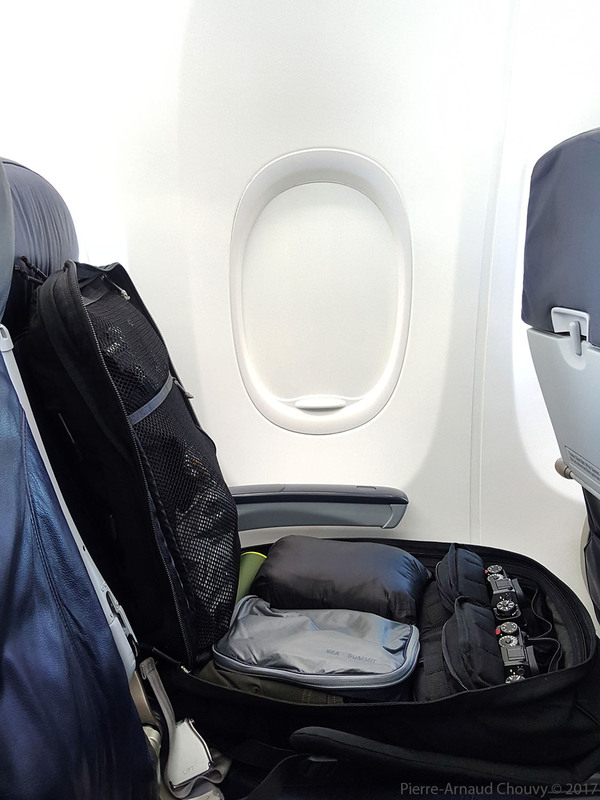 The top half of the bag’s internal space is now empty and available for additional equipment, food, clothes, writing material, binoculars, power bank, LED lights or strobe lights, etc. (water bottles being carried in side pouches). Of course, since I now travel with two mounted bodies and two extra lenses (total of 4 lenses, instead of 3 back with the Canon gear), my bag ends up weighing about 400 g. more, depending on the fourth lens that I choose. But if I am to be exact about weight, I must add to each Fujifilm X-T2 (507 g), one Peak Design Arca-compatible quick plate (30 g), one Peak Design Slide Lite shoulder strap (141 g), two Peak Design anchors, and one Abrahamsson Mini Softrelease, for a total weight of 678 g. each. That is, 342 g added to the bag whose weight is now about 5.5 kg (with four lenses). Rather light for a bag with two bodies, four lenses and a few extra batteries. Total weight of geared-up bag with two X-T2, four lenses, camera straps, tripod plates, about three extra batteries: 5.500 kg. LowePro Pro Tactic 450 AW with two Fuji X-T2, four lenses, small RRS tripod, Leica binoculars, writing material, Maxpedition, pouches and a Peak Design Capture Pro. 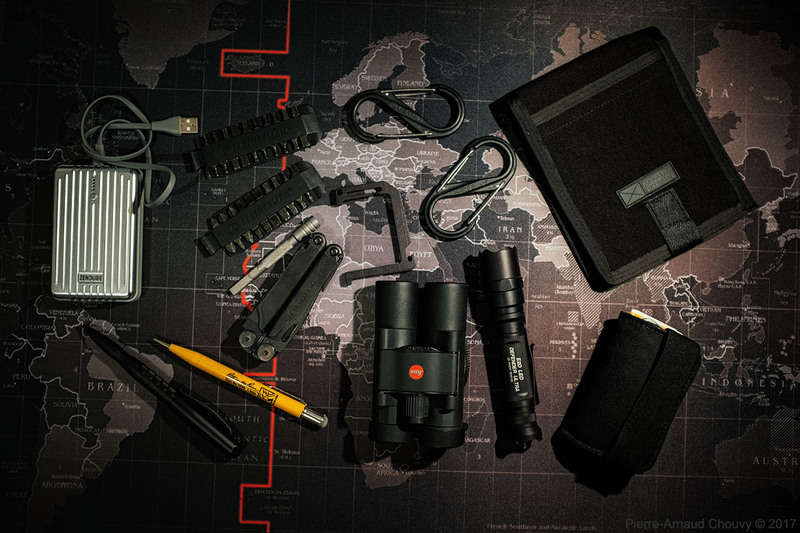 Binoculars, writing material, power bank, torch, knife, small emergency kit, carabineers, etc. Total weight of 6.989 kg (or 8.164 kg with a tripod: Gitzo Traveler GT1555T + RRS BH-25 Pro ball head). Water, clothes, guidebook, maps may at this stage need to be added and the overall bag’s weight can then easily reach 10 to 12 kg, which is a very reasonable weight for the hiking bag of any serious photographer. It is worth noting here that the LowePro Pro Tactic 450 AW remains rather comfortable while carrying such a heavy load. LowePro Pro Tactic 450 AW with two 5.11 H2O water carriers, one Nalgene bottle, and a carbon Gitzo tripod. The ideal if not perfect carry-on, as far as I’m concerned, and actually according to many reviewers, is the Goruck GR2 in its 40L size. As explained by Goruck: “The GR2 travels hard and well and complies with TSA size requirements for carry-on bags. Patterned after Special Forces medical rucks, GR2 is big, tough, and efficiently stores all your stuff in its 3 compartments and 8 pockets. If you want to travel the world with one bag, it’s a ruck, and it’s GR2”. Goruck GR2 (40L) and two Nite Ize S-Biner carabineers. Packed with two cameras, two lenses, and a week’s worth of clothing and various gear. The GR2 is a backpack that can be trusted no matter how much weight is to be carried. Handmade in the U.S.A. from 1000 denier CORDURA and YKK zippers, the bag’s high stress points have been tested at over 180 kgs and countless participants to Goruck challenges (team events that lasts 10-65 kms and around 4-24 hours, depending on the level, with bags weighted down with 5 to 15 kgs) put the bags to the test in tough real-life situations. At 32 x 56 x 23 centimeters and 2 kgs, the GR2 is a large bag but one that is carry-on compliant (TSA carry-on compliant). 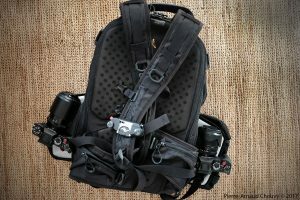 It opens flat, has a very large laptop compartment (with a “false bottom” to protect the laptop), can hold a hydration bladder (a velcro opening at the top of the ruck allows for a hydration hose to come out), has integrated pockets and mesh compartments, and 4 rows of external and internal MOLLE webbing that make customization easy. The bag has very solid extra padded shoulder straps that make carrying heavy loads as comfortable as possible. Carryology.com, amongst others, rated the GR2 as the best carry-on bag: “We can’t think of a better Carry On bag to travel the world with. The GR2 fits everything you need, blends in to anywhere you go, and can be customized with modules to most configurations you desire”. And customization is what made me choose the GR2 as I wanted to use it to carry both camera gear and travel essentials (clothing, toiletry, tablet, computer, chargers, cables, etc.). 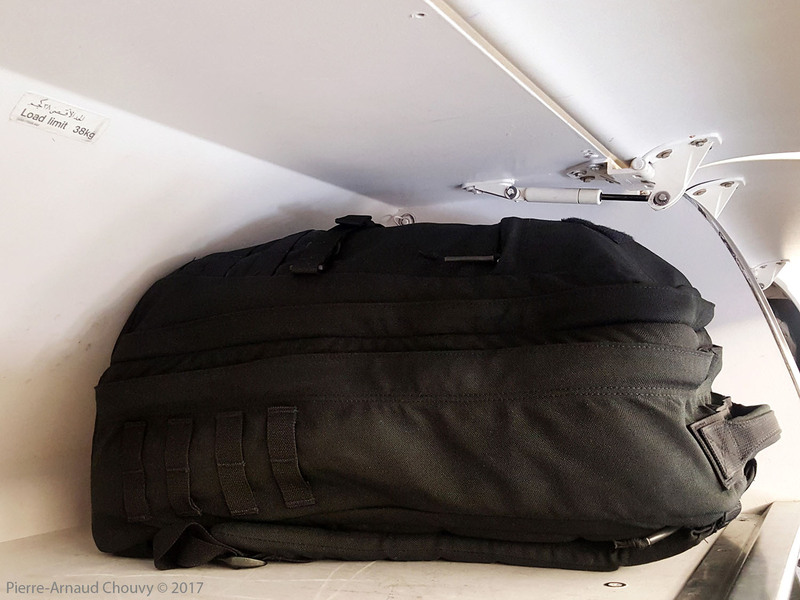 Goruck GR2 (40L) in an overhead plane bin. While there are many reviews on the Web that detail how the GR2 is large and convenient enough as a carry-on only bag for extended travels, not many reviewers have detailed how it could be used to also carry camera gear. 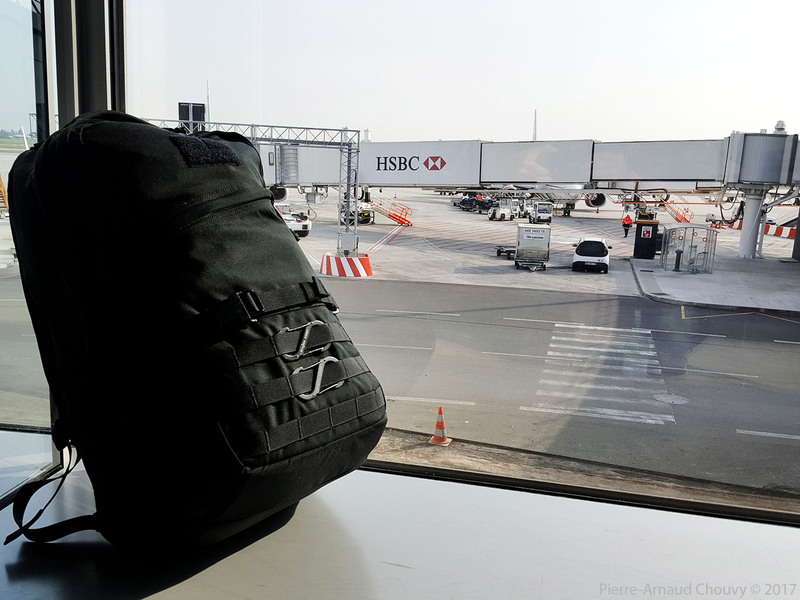 Goruck offers padded pouches that can attach to the MOLLE webbing inside the bag’s main compartment and some photographers have been using these pouches to that end, usually with unmounted DSLRs or with one mirrorless body and a couple lenses at most. I realized that packing two mounted bodies in such a pouch, without having one camera rubbing against the other and without taking too much space in my GR2, I would have to resort to further customization. The width of the GR2 allows for two 5.11 padded 6×6 pouches (2 x 142 g) to be installed horizontally and side to side high up in the bag (2.284 kg altogether), which enables me to safely carry two Fuji X-T2 with attached lenses (up to a Fujinon 90mm f/2.0, with an overall camera + lens length of 16 cm). Each pouch can be easily and quickly accessed from the top of the bag, where the cameras are safely stored. Retrieving the cameras is not as easy as with the LowePro Pro Tactic 450 AW of course but here we are obviously dealing with a different compromise. Goruck GR2 (40L) with two 5.11 padded 6×6 pouches, two Fuji X-T2, two lenses, and one week’s worth of travel essentials. 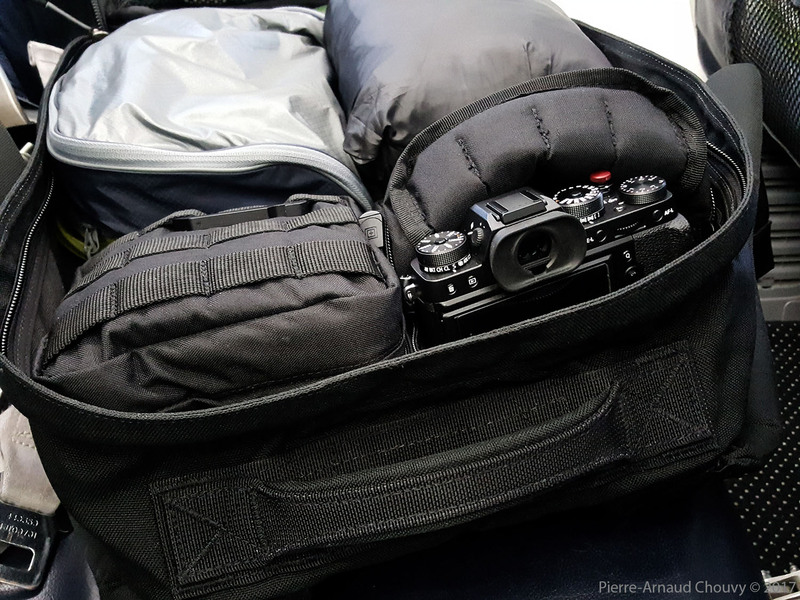 Paired with two 5.11 padded 6×6 pouches, the GR2, especially when equipped with a Peak Design Capture Pro V2 on one shoulder strap (or one Capture on each strap), ends up being a truly excellent carry-on bag for the travelling photographer. But since the GR2 is a bit on the large and heavy side to be used as a day pack I include in its front compartment a folded LowePro Passport Sling III (455 g) to serve as a day pack that can carry two cameras (especially when adding a large Tenba Messenger Wrap (84 g.) to add protection for one of the two cameras), a small tripod (Really Right Stuff Pocket Pod TFA-01 Ultra tripod + BH-25 Pro ball head: 312 g), a bottle of water (Vapur Element, foldable and equipped with a carabineer: 38g for a 0.7 L. bottle), and a few other items. Goruck GR2 (40L), folded LowePro Pro Tactic 450 AW and Tenba Messenger Wrap. 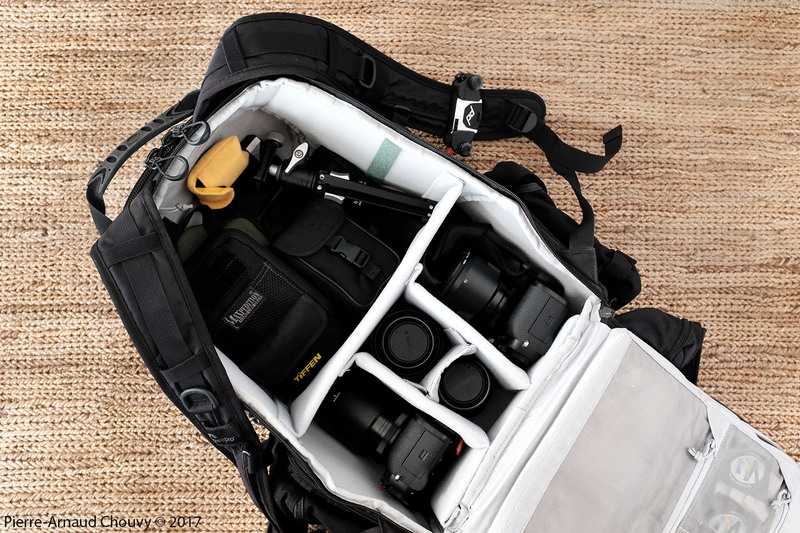 While there are many brands of cameras bags and many styles of bags, it seems that, in the end, and for rather evident reasons, the backpack is the best choice for the travelling photographer. Backpacks can be used to carry heavy loads in the most confortable way and with the least amount of spinal stress. Backpacks also are the least likely to restrict freedom of movement when hiking, running, or even climbing. Yet there is not one backpack that can be considered as perfect or even ideal and most photographers have at least two or three bags at their disposal. As of December 2017, the LowePro Pro Tactic 450 AW and the Goruck GR2 are amongst the best and, thanks to their customization potential, the most versatile backpacks there are, yet for different uses. Of course, the fact that they are both equipped with MOLLE webbing is not a coincidence. Backpacks that can be customized and even expanded, such as the LowePro Pro Tactic 450 AW and the Goruck GR2, have a clear advantage over other bags, especially for travellers who must regularly adapt to size-and-weight-related constraints imposed by airport regulations and airline limitations on the one hand and by hiking requirements on the other hand. 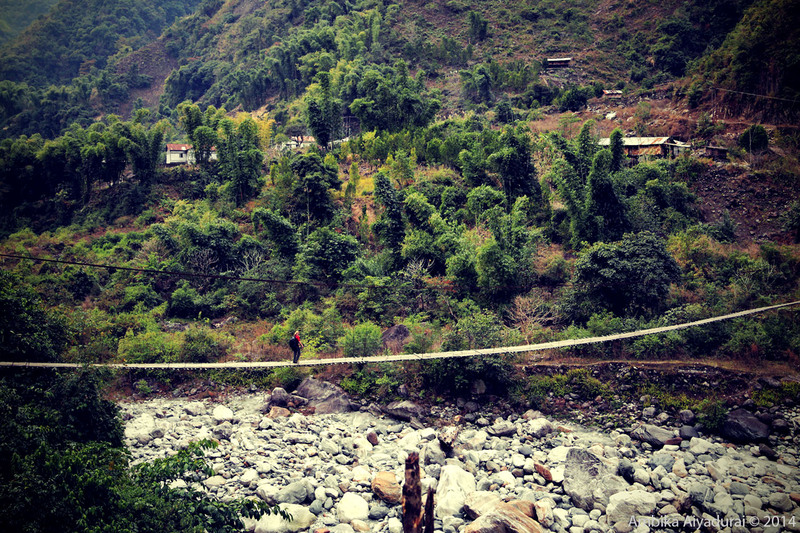 Crossing a foot bridge in Arunachal Pradesh, India, in 2014, with a Kata R-104 backpack.